Solvents can be challenging to measure but almost any chemical can be measured. Typically this involves using a specialty lab and the specimen collection needs to be done in an exact method to minimize compromising the sample. Good results are achieved with blood samples, although some samples are best with 24-hour urine. There is a test I have had good results with that is a urine dipstick sample. It is a good test but does not measure a wide array of chemicals, but due to ease of sampling, it can be a good beginning point for adults and children. What are Solvents and pesticides? A solvent is any liquid in which another substance can be dissolved. The focus of this article is on petroleum-based / liquid solvents, as they are most common and more toxic. 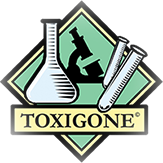 Some commonly used solvent and pesticide names are benzene, xylene, styrene, hexane, octane, pyrethrins, DDT, DDE, PCB’s (polychlorinated biphenyls) etc. Solvents focus on the immune system, particularly the bone marrow, nervous system, and hormone systems. They can mimic or block your bodies hormones, neurotransmitters, and white blood cells, meaning the immune system can be blocked and normal functioning of other systems will be altered in a negative way. These organics are fat soluble, and therefore migrate toward fatty tissues, for example, high amounts of DDT have been found in breast tissue and are thought to have some role in breast cancer. Pesticides are usually shorter-lived except for DDT/DDE (40 years) but are extreme neurological toxins and often are synthesized with toxic metals such as mercury. Many of these solvents are petroleum products and usually contain some amount of heavy metal used during the chemicals synthesis. Commonly they come from transportation (auto, jet etc. ), power plants, factories, electronics, computers, and mining. Some everyday products containing varying amounts of solvents are herbicides, pesticides, air fresheners, cleaners, carpets, and anti-mold products. Mental / Emotional: Mood swings, depression, anxiety, nervousness, ups and downs, confusion, and instability. Digestive: Metallic taste, nausea, diarrhea, constipation, sluggishness, acid stomach, regurgitation, indigestion, trouble digesting foods, bloating, and gas. Muscle / Bone: Tension, tightness, loss of function, inflammation, and swelling.